Requirements: Roleplayers, roleplayers, and more roleplayers. We want to see well thought out characters that are not only already well developed in terms of who they are, but who also have a possibility to evolve and change through IC stories and events in the game itself. Not every character will have an epiphany, but there has to be scope for development and we don't want to arrive at that horrible situation where at every RP session your character sits at an inn or anywhere else and is constantly re-telling their written background. That's not a character, that's a script. Maturity is paramount. No, that doesn't mean in terms of age but in terms of behaviour both IC and OOC, particularly so given part of this guild's nature. We want creativity, we want people willing and eager to contribute. We're not expecting to have a guild roster of more than 20-30 people, but we do want all those who join to contribute to the development and evolution of the House, and the development and growth of the Hyrkania community by extension. What we do not want are players who's only interest is in ERP, if that applies to you then you are reading the wrong thread, since that is not what we are about. An acceptance of it as part of the guilds business and roleplaying, yes by all means. A focus on it to the exclusion of anything else - absolutely not. !Important! Due to the nature of the guild's business applicants MUST be over the age of 18. Guild info/RolePlay info: The House of the Rose is intended to be a heavy roleplaying guild with a focus above all else on roleplaying and character development, on providing more immersion for the world of Hyboria and helping to bring it to life with what we hope and intend will be excellent roleplaying. Our aim is ultimately that players can see a member of our guild and know that they can expect to interact with someone who will provide them with quality roleplaying and enjoyment of the highest order. Who are the House of The Rose? The House of the Rose is intended to be a heavy roleplaying guild with a focus above all else on roleplaying and character development, on providing more immersion for the world of Hyboria and helping to bring it to life with what we hope and intend will be excellent roleplaying. Our aim is ultimately that players can see a member of our guild and know that they can expect to interact with someone who will provide them with quality roleplaying and enjoyment of the highest order. In the simplest of terms, a brothel, a bordello situated opposite the trade hall in Old Tarantia on the corner of the Avenue of Roses after which - along with the numerous bushes outside the premises - it is named. The brothel is the headquarters and visible 'face' of our guild which we intend will be run as a business. So you are all whores then? No, far from it. 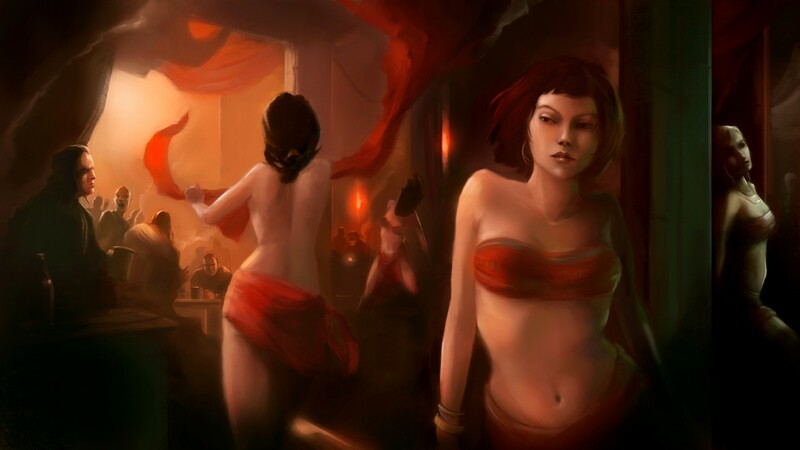 The brothel is certainly the outward face of the business and as such, yes, as members we will have some characters who will roleplay whores with all that entails, and who will also operate according to strict guild rules meaning that the enjoyment of other players is not spoiled by seeing or being exposed to anything they find distasteful. The House of The Rose, though, also has other areas covering a broad range of the underworld in terms of skullduggery and will it is hoped cater for all those who have a taste for the less up market aspects of R.E. Howard's Hyboria, including thieves, hired swords, spies, information brokers, pickpockets and bodyguards as well as women willing to sell themselves for entertainment. No, wrong again. It is intended that the House of Rose will be a neutral guild, selling services of all kinds. It is a business, which means that 'taking sides' isn't advisable. We aim to fill a middle ground, yes we will work for the good guys if asked - for a price - but that doesn't mean that occasionally we won't accept contracts from the more nefarious either. One thing that we will guarantee though is discretion, no one employing us for whatever service need fear we will pass it on to others - again - it's bad for business. Alright, you have convinced me, what next? If you are a dedicated roleplayer and attracted by what you have read, are over the age of eighteen (given the nature of the guild's business that rule is strictly enforced) the you can either contact an officer or the leader IG for an informal chat or head on over to our boards at.. well, here, where you will find more information about the guild including our application process as well as details on how to contact us and where to find us should you need to hire us for any of the services we supply. Registration on the forum is only required if you want to join the guild though it is also possible to register simply as a friend of the guild and still post in certain sections of the boards. Indeed, if you simply want to do that you are more than welcome. Footnote: Yes, this information is blatantly and shamelessly stolen from Caprasia's original posts. However, as we seek to continue the path she set out, they still very much apply and do an excellent job of describing the House. What is your policy on alts? We welcome mains, alts and alts of alts. Even alts of alts of alts or alt mains! We're aware that there are guilds out there better suited for pvp and raiding, and you're of course free to join them with your mains. All we ask is a certain amount of dedication to the House next to your other characters. I'm not going to make things mandatory or instate any rules about 'you -must- attend at least 3 nights a week' or something, but we ask you to show some commitment to the House now and again. What if I want to ply my non-whore trade and join the House as a thief or shady figure? Be subtle. As a thief or shady figure you should already have some notion of how that works. You might need a bit of a hook to start a conversation about it, as the House, traditionally, makes damn sure that hardly anyone is aware that there's more than just a brothel. Whatever you do, if you decide to strike up an IC conversation, do -not- walk up to us in front of the House and go "Hi, I'm a thief and murderer and heard you guys are too".